Hello! Back from Further Confusion 2017 with lots to talk about. Starting off with a whole new way to get yourself a head for your anthropomorphic costume! 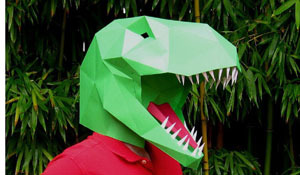 Tetra Variations is a company started by a fan who goes by the name of Mr. T-Rex. (He’s working hard on making that Dr. T-Rex, which is a scary thought.) For now he specializes in creating geometric patterns which you can purchase for download, print out on your own stiff paper, then cut and paste into masks, puppets, toys, and other useful items. Dinosaurs are a specialty, but as you can see from his store there are lots of other animals to be found as well. Sign up for his newsletter and he’ll also let you know when new designs come out.